Migration is the barometer of changing socio-economic and political conditions at the national level and speaks of the levels of economic inequalities existing in the economy. With the share of Gross Domestic Product (GDP) of agriculture falling down, a large number of people along with their families is shifting to urban areas in search of better employment opportunities. As in urban areas, different types of industries flourish that have the capacity to absorb workforce in large numbers. As per 64th National Sample Survey Office (NSSO) Report in 2007-08, internal migrants constitutes 28.5% of the population of the country and the construction industry was the dominant employer and a major destination employing about 41.6% of the rural migrants followed by Manufacturing Industry with 17% and Transportation with 16.8%. Migrants are mostly employed in the sectors of construction, domestic work, textile, brick-kilns, transportation, mines, and quarries (Deshingkar and Akter 2009). Internal migration (within a country) is an essential and inevitable component of the economic and social life of the country, given regional imbalances and labor shortages, safe migration should be promoted to maximize its benefits. However, in India, internal migration has been accorded very low priority by the government and policies of the Indian States have largely failed in providing any form of legal or social protection to this vulnerable group. In the absence of a coherent policy framework and strategy, migration imposes heavy costs on human development through poor labor arrangements and working conditions of migrants; denying basic entitlements such as access to decent shelter, fair priced food, subsidized healthcare facilities, and/or training and education and access to finance. Above all, they are unable to participate in the formal electoral system and are denied a fundamental citizenship right to vote. 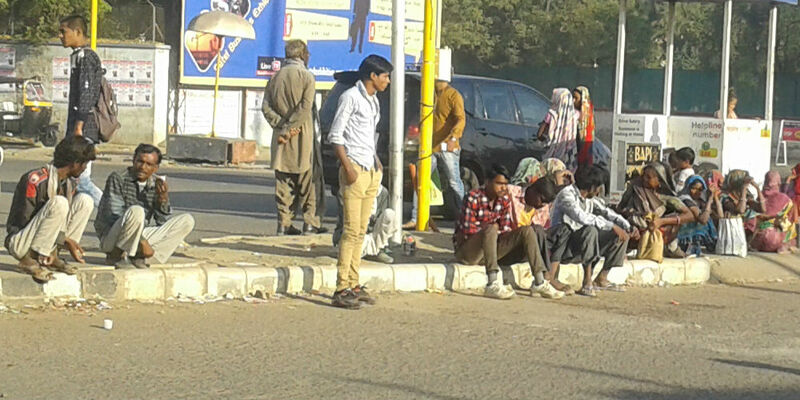 In fact, unorganized sector consists a large proportion of the migrant workforce. Their entry into the labor markets is marked with several endemic disadvantages. Devoid of critical skills, information, and bargaining power, migrant workers often get caught in exploitative labor arrangements that force them to work in low-end, low-value, hazardous work. Lack of identity and legal protection accentuates this problem. The hardships of migrant workers are especially magnified when state boundaries are crossed and the distance between the “source” and “destination” increases. There is a legislation known as Inter-State Migrant Workers Act, 1979 which aims to safeguard migrants. However, it is obsolete and is hardly enforced anywhere. A serious constraint in framing an effective policy is the lack of credible data on the incidence of seasonal migration. Seasonal and temporary migration results in disruption of regular and continued schooling of children, adversely affecting their human capital formation and contributing to the inter-generational transmission of poverty. Children who accompany migrating parents end up working at the destinations to supplement family income and are often inducted as labor at worksites as early as the age of 6–7 years and are subjected to health and security risks. There is a close link between the economic growth of a city and increasing informal settlements in urban areas. On the one hand, cities do attract more migrants for livelihood opportunities, on the other hand, due to lack of an adequate housing and basic services for water and sanitation poor migrants live in informal settlements. Poor supply of low-income housing for migrants both ownership and rental in urban centers is a key issue. The prevalence of slum settlements with poor infrastructure results poor living condition has been one of the areas of concern over the years. Most of the demand is at present met by informal sectors. The question of housing for migrants cannot be delinked from the broader issues of housing for urban poor living in informal settlements. The National Urban Housing & Habitat Policy (NUHHP), 2007 of Government of India aims at promoting sustainable development of habitat in the country with a view to ensuring equitable supply of land, shelter, and services at affordable prices to the most vulnerable sections – urban homeless. As part of this policy framework, the scheme titled “Shelter for Urban Homeless” (SUH) under National Urban Livelihood Mission (NULM) provides support to cities through State Government to provide shelters equipped with essential services to the urban homeless. The shelter will also provide a single window system to register them, and link them with social and economic benefits. Bhuj is also home to thousands of families belong to different caste and communities living in temporary settlements without basic services. Urban Setu with support from Aajeevika Bureau and Hunnarshala in collaboration with Nagarpalika has started understanding issues of migrants in the city and to provide shelter and basic services and entitlements for these people. Since the economy of the country as a whole and the district of Kutch has improved after the 2001 earthquake, there has been a steady increase of migrants, particularly in the construction and industries sectors. The conditions in which they live and work are pathetic.